Sportsmen from the SC “Borets” (Kropivnitskiy city) also were among them. In general, Ukrainian fighters took 9 gold, 5 silver and 2 bronze medals. Athletes mentioned the high level of the organization and the huge amount of well-trained contenders. “I am fully satisfied with the work of my sportsmen. They showed a great level of the sports technique! They trained the whole summer to get well-deserved medals today. We all know that the real hard work always will be amply rewarded!” – shared the head coach of the club Ievgen Skyrda. The young athletes of SC “Borets” won all main prizes in absolute category. Serhii Krasovskyi took gold in both categories: his weight and absolute weight. 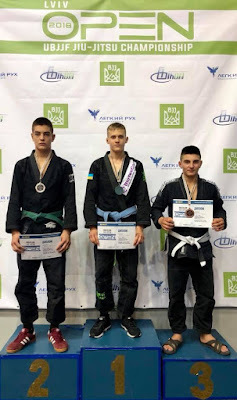 Serhii Rusnak took home gold in his weight and silver medal in absolute category. Danya Kuropyatnik won gold in his weight category and took bronze in absolute.